In this week's North African Dispatches, Kateb Salim looks at the tense status-quo in Algeria and examines the key factors determining what is likely to happen next. He’s gone! Pharaoh finally understood he was the problem. Better yet, Hosni Mubarak finally managed to find a safe exit through which he, his family and most importantly, his finances could make a run for it! With his departure, Egypt breathes again. In fact, the Arab street as a whole celebrated the success of the Egyptian Revolution. For weeks, the entire region was there to witness history unfold as millions of Egyptians took to the streets and in a truly heroic movement deposed the seemingly unshakeable autocrat. In the euphoria which followed Mubarak’s departure, the Army seized power and promised to go ahead with reforms demanded by the protestors. Mubarak had done the same following Sadat’s assassination, and one cannot help but fear the possibility of a regime perpetuating itself through the sacrifice of its figurehead. Throughout the revolt, the army’s lukewarm support for the revolution and its tardy rally to the cause are greater causes for concern than celebration. Surely the end of Mubarak is not the end of the system nor is it the start of the democracy which the movement’s founders probably envision. Revolutions are often confiscated by those who join them last. Egyptians, like the Tunisians before them, should not stop at this success and make the fight for democracy a daily struggle! Whilst Egypt rejoiced, nearby Algeria stood in anticipation at the call for pro-democracy protests on the 12th of February. A coordination made up of several members of civil society and political parties called for a rally on Algiers’ 1st of May square and throughout the nation hoping to emulate the wind of change blowing through the region. Despite high ambitions to mobilize, they were somewhat left short with only a few thousand showing up. Why was this case? 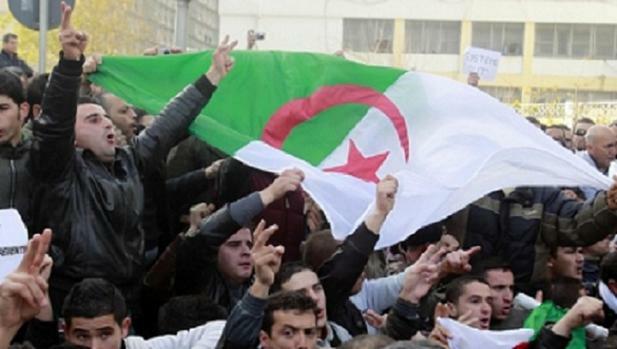 Algeria has always been a land of rebels, the ‘Mecca for revolutions and revolutionaries’. In the sixties, it emerged an independent nation following an atrocious war with the French colonizer which gained it a sobriquet as the land of the ‘1.5 million martyrs’. In 1988, a recession-hit Algeria witnessed events comparable to those which recently took place in Egypt and Tunisia. Millions of Algerians took to the streets in nationwide riots and protests to demand the end of the FLN’s one-party rule and reclaim their political and socio-economic rights. In this respect, Algeria is the unrecognized antecedent to much of the revolts we are now witnessing. The rise of an Islamist tsunami and the coming to power of the Army, as a result of cancelled democratic elections, would sadly put an end to an unparalleled-and short-lived-period of democracy. The North African nation quickly plunged into a tragic decade of violence and Algerians were left profoundly scarred from a civil war of unmatched brutality, widespread terror and complete paranoia. Today, the country’s problems remain multiple and complex but stem from a reality easily observed: Algeria is rich, Algerians are not. Whilst macro-economic indicators are green, social and human development indicators show bright red. Home to considerable oil and gas reserves, Algeria has yet to rid itself of an exclusive reliance on primary sector exports to generate growth. This has simultaneously created a dangerously heavy dependency on importation. In 12 years, Algeria has made a whopping 600 Billion dollars in benefits from its oil industry with not much to show for it. Salaries are low, unemployment is high and inequality continues to grow despite figures which state otherwise. Despite efforts to restore state investment aimed at infrastructure and education, money is often poorly spent or squandered. The plague of corruption and nepotism recently materialized in the eye of the public when the country’s economic pillar, SONATRACH (petroleum company), was found to be riddled with handouts and shady dealings amongst officials. Finally, the bureaucracy continues to be a burdensome, onerous and tedious labyrinth stifling the formation of capital and the encouragement of innovation. Start-ups that do flourish do so under the state’s watchful eye which inevitably hinders the chance for job creation. Doctors, teachers and the civil service therein rely on very low wages compared to other economies where capital is created as opposed to simply distributed. Finally, no real diversification to other resource generating sectors was ever undertaken and the country’s shy industrialization has always been subjected to petty ideological battles and superfluous regional favoritism. In this climate, Algeria’s economy and stability continue to be tributary to international oil and gas prices as well as that of basic foodstuffs. As recently as December, countrywide riots broke-out in response to sharp increases in the prices of cooking oil and sugar. In a country where many struggle to make ends meet, slight increases in basic food prices easily provoke the ire of the underprivileged. The Algerian press often mentions that in the sole year of 2010, 10 000 riots and protests took place throughout the country. More than anything, there is the imperative for housing. Riots also regularly break out over unjustly distributed public housing as it has become a fundamental frustration in the day to day well-being of many families. Why then did Algerians, in this apparently negative environment, not march by the hundreds of thousands under the circumstances? For one, there is the fear of violence breaking out. The government mobilized for the occasion a daunting arsenal of helicopters and the odd 30 000 anti-riot police in the capital; a sign that nothing was being left to chance in the higher echelons of the country’s polity. Despite a recent promise to lift the country’s 19 year state of emergency, protestors were frigidly reminded that protests were not authorized in the capital Algiers. With trains suspended and all major access routes carefully monitored, any sort of movement from neighboring counties was rendered impossible. All of these measures obliviously made for a particularly tense build up which evidently left many wondering, whether it was worth putting one’s own security at risk. The tragic reality for Algerians today is that no political party or figure seems able enough of rallying then aptly voicing grievances around one truly coherent set of political objectives (i.e. change!). This problem originates primarily in the political elite’s inability or unwillingness to rejuvenate it. Both the opposition and government boast figures at the other end of the country’s demographic makeup. With a population amongst the world’s youngest- the average Algerian being 24- any political figure over the age of 50, talking of ‘change we can believe in’ is bound to seem out of touch or irrelevant. All of these observations bring me to the final possible reason behind Saturday’s meager showing. This movement for change does not yet resonate to a majority because it might appear, with the presence of certain political parties and/or figures, as another venture through which they may gain greater exposure. Though intense grievances exist in the country, Algerians continue to be highly skeptical of political parties whether they are of the opposition or not. They are seen as self-serving or in league with the powers that be thereby rendering their actions legitimate to audiences already acquired to their beliefs. Young Algerians remain desperate for change, thirsty for a better life and disenchanted with their overall situation. Politics and ideology aside, they aspire to nothing more than dignity and a visionary project for their society. For some it can come through economic accomplishment and personal stability. For others it is a sense of belonging and a renewed trust in the country’s politics. Over the past weeks, the attempts by over a dozen people to immolate themselves publically, served as a bleak reminder to all of the profound malaise felt throughout vast sections of the nation. In this context, whilst many will continue to debate over the success/failure of Saturday’s march, what is certain is that the march certainly broke a long-standing taboo of challenging the status-quo. Algeria is obviously a horse of a different colour. Though, we must still hope that the winds of change blowing through the region, coupled with the new successes in Egypt and Tunisia will continue to inspire and embolden the people of Algeria, particularly young Algerians, to shake loose the shackles of injustice and insufficiency, come what may. Change and progress always costs something, and perhaps a leader/voice of the movement is needed. However, leaders are often birthed in the struggle, and if Algerians do not grow weary in their cause, the next MLK, or Gandhi, or Moussavi, may emerge. Good read, very insightful. Not everything is lost. Change can happen in Algeria. People may be scared of a violent outbreak, however their actual life conditions and the future of the country will end up having more power, and revolution can happen. The army’s support is extremely important for a peaceful revolution, and Algeria can have it too because army’s all over the Middle East feel the international pressure to protect people’s rights of reunion and expression and maintain peace. Young Algerians just need a little push, and a little more time than those in other countries as they are haunted by their past. As Ali Yahia Abdenu said “if young people are with us, they we have already won”. Mobilizations are prepared for every saturday from now on. Keep optimism, change can happen. Algeria is different because the Algerians are different, i mean all Algerians; the people, the political parties, the army and the system itself. in Algeria you cannot expect that the army will back a revolution, no, the army is about to make the change it sees necessary and it will never allow that its “project” be stopped by a revolution such as the egyptian or the tunisian. the struggle between bouteflika and the army hasn’t ended yet. yes bouteflika is in a difficult situation by he is still fighting and holding on to power. the alliances in Algeria are different, the army who brought boutef to power wants him out now, they sent him two messages with very strong language (the assassination of Ali Tounsi and the scandals of sonatrach which led to the resignation of chakib khalil) and from that moment on, the government no longer obeys to what bouteflika decides, he is isolated. in addition, the Algerian people today is not the Algerian peole of the 1980s, most people are in favour of the situation as it stands, it allows for gaining easy money for the rich as well as for the poor. there is no presence of political parties and none of the civil society, anarchy is the only term that can describe the political, economic and social life in Algeria. to put it simply, Algeria is not yet ready for a change because its people are not. this is a reality that is quite hard to understand when someone lives outside Algeria, and quite hard to accept when the love of their country pushes for optimism, however living inside Algeria and between Algerians doesn’t leave much room for hope.. at least for now.